After this You may fill the lower NLUs in any order depending on which places you want to go or avoid. Please note that once you make a list, Then your college allotment will be based on your merit and the list you provide as your preference. For example, let’s say your rank is 10 and the first NLU on your list is NLSIU and NLSIU picks the students from Rank 1 to 57, they will look at your rank and then check your list, both match and they will pick you. 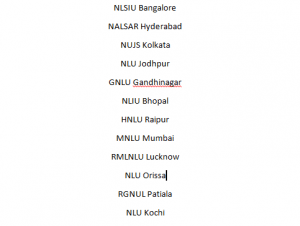 However if your rank is say 10 again, and the first college on your list is NUJS (happens all the time if you’re from Kolkata), while you are eligible for NLS, they will allot you the college you prefer over NLS. 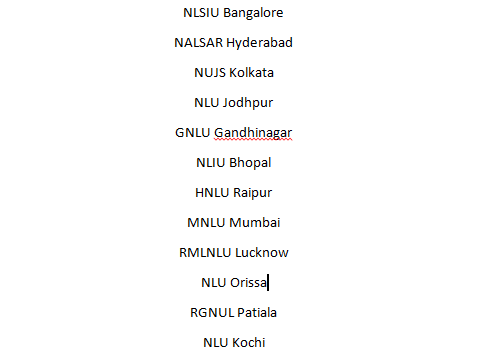 The person ahead of you gets their choice college first and if there are no vacancies left then they give you the college just below your preferred college on the list. So choose wisely. Use this list as a benchmark but feel free to make changes depending on your geographical preference etc. If you are in touch with previous year students talk to them. You may also float your list on me in black and take opinions. Nor from just any smartass on the forum, but if that person is in an NLU himself/herself. In case of any confusion please stick to this list.